Established in 1989 Bali Adventure Tours is the most-known Bali tours operator with World class activities ranging from White Water Rafting adventures, River Kayaking, Jungle Trekking, Mountain Cycling and Helicopter Sky Tours as well as World class facilities such as the Ubud Adventure Centre and the Elephant Safari Park & Lodge where you can touch, feed and ride an Elephant through the tropical jungle of Taro, just North of Ubud. Celebrate your Wedding or vow renewals at the Elephant Park or stay at the luxury Elephant Safari Park Lodge and Wellness Spa. See Elephants painting and take home Elephant painted artwork, helping to save this endangered species. Wander through the Elephant Museum or tropical botanical gardens. 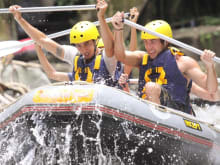 All tours are owned and operated by 'Bali Adventure Tours'. It was amazing experience for us. Feeding , riding was exciting.Family friendly. One of the most adventurous things I've ever done! The whole process was smooth, from the booking in Voyagin, pickup in the hotel, briefing in venue and rafting. Today we visited the Elephants at Taro. What a wonderful day it was, very informative, funny, exciting and fascinating. It was my wife’s first encounter with Elephants so going to Taro was a great venue to learn and be enthralled by these lovely animals. The park itself is a good size and it is very well maintained, the fascilities are excellent, and the day was organised well. It’s not one of those trips that make you feel rushed or that it’s all choreographed to within an inch of its life, infact quite the opposite. We were told that we could stay longer in the park if we wanted and to just let them know and they would also rearrange the transport. If we wanted to watch the presentations just go ahead with which ever one suited, or watch both. Have lunch when it suited you, go and wander over to the Elephants and take more photo,s or watch them being fed. Great fun. The only time you were called to be at a particular place was for a ride on the Elephants. Really good fun and very informative when talking to their handlers. We, like a lot of people, read up on the trip before we went. We weren’t sure about the ethics of the park or riding them etc etc. So let me give you my opinion on what I saw today. The Elephants are very well looked after. They looked to us and others like they were enjoying what they did. They loved the interaction with people. They have plenty of food, breaks, water, fun, welfare and medical attention should they need it. The local community is involved with their upkeep and that includes local farmers supplying food and by being employed at the Park working directly with the Elephants. It is true that at certain times the Elephants are chained by one leg. There are several good reasons for that including the larger Elephants not bullying the smaller ones. Not stealing other Elephants food, not destroying the local habitat, vegetation, infrastructure. And it’s also a Government Directive. It doesn’t harm the elephant, cause them stress or discomfort. I have read a lot of postings online recently by people who object to such parks, and I understand completely their concerns. In an ideal world things would be very different. 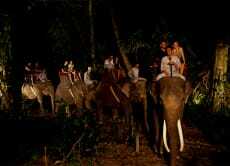 But understand that these Elephants, apart from five ( who were born in the park) were rescued from Samatra. Given a new home, care and lots of TLC. They pay for themselves, employ local people, and educate the rest of us. The alternative would probably be death. A no brainier really. I would love to go and see them again one day. Hopefully reading this will persuade one or two of you too go and have a great day out as well. All the best wishes to everyone involved with the park. We had a fantastic day. Got picked up from the cruise port in a nice air conditioned vehicle by a nice young man and the ride was very comfortable. The park was great and we had a lovely day then got dropped off back at the pier. Very smooth operation. Would definitely recommend. And the elephants are not mistreated at all. They are rescued Sumatran elephants. My fiancé and I loved this activity. 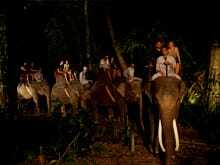 The highlight was definitely the elephant ride, they are such large but graceful creatures. It is obvious that the staff at the park genuinely care for the elephants and that they are well looked after and that they aren’t viewed merely as a way to make money. We also enjoyed the show and loved the fact that the park uses reward (food) based training for the young elephants. All in all it was a great experience.